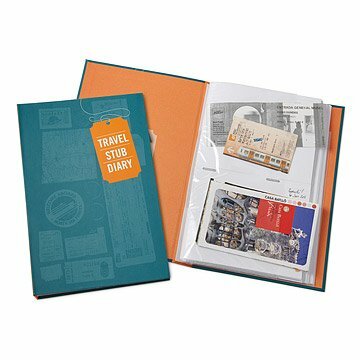 Preserve memories of your past adventures with this travel stub diary. You'll never forget the summer you slept under the boardwalk with your siblings, your honeymoon in Paris, the cross-country road trip you took after college, and with this Travel Stub Diary you'll be able to relive those adventures again and again. While older generations kept a record of their travels on the lid of their steamer truck, with this handy take-along album newer generations now have a place to store and share the priceless fragments kept from journeys. This travel companion comes with clear sleeves to store your memorabilia, including postcards, maps, brochures, ticket stubs and snapshots, as well as space in the margins to jot down every detail. Acid-free pages will preserve your memories, so you'll be able to travel back and follow your footprints, no matter how many years it's been since you made them. Printed in China. We can't wait to start filling this with momento's from all our travels! Not only will this be great to hold mementos, but there are places to write dates and notes next to each item that is stored in its pages. Memory and Ticket Stub Keeper! This was a perfect gift for our exchange daughter's birthday! She has been collecting items and ticket stubs during her time in the US and this travel diary was perfect for all her special memories!! She loves the journal - so easy to organize her memories! Beautiful colors, easy to use and easy to love! This was the perfect Christmas gift! Caleb will be able to commemorate his travels with this handy organizer. He loves it! My husband and I received this gift a few years ago, and have recently bought a few more. It's the perfect way to keep plane tickets, museum tickets, brochures, etc. from your trip, as an easy way to hold on to all of those memories. We've saved items in this book from our last four international trips, and plan on continuing this tradition. Though it's a "Travel" journal, it's teally great for collecting any ephemera, even if your travels are close to home. Great for memorable receipts, tags, & ticket stubs, to name a few.